Though the military may not be the first thing that comes to mind when a budding instrumentalist or singer announces an interest in a professional career in music, military bands offer a historic opportunity within the armed forces for exceptional musicians to serve their country. Though John Philip Sousa’s famous marches and other patriotic tunes are the traditional repertoire of a military band, the nearly 6,500 musicians who make up military bands are experts in everything from bluegrass to rock to classic jazz to calypso. The appeal of the bands is immense, with thousands of qualified musicians clamoring for spots in the 130 bands across the five branches of the military. These performers, who have graduated from the finest conservatories in the United States, audition for the bands through a rigorous blind audition process—the same method used by professional symphony orchestras across the country—and are expected to have excellent sight reading skills, mastery of diverse repertoires, and the ability to work cohesively in a team. While they do not see combat, many are required to attend basic training and pass a physical fitness test. Such a diverse and impressive display of talent does not come cheap. 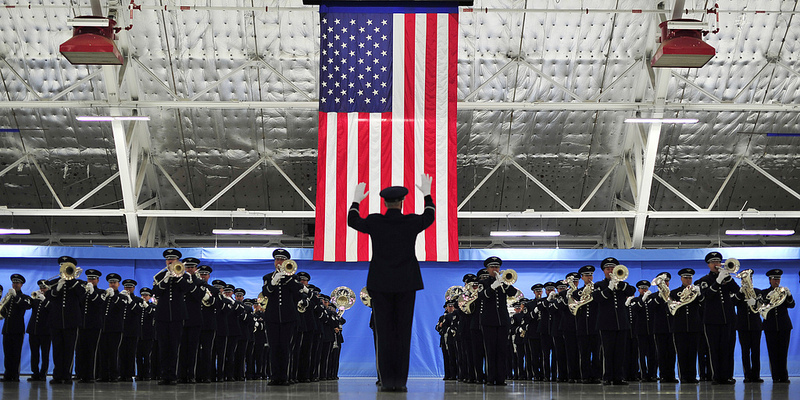 The New York Times recently pointed out that the total cost of the military bands was about $437 million last year. For comparison, the Fiscal Year 2015 Enacted Budget for the Department of Defense was $560.4 billion. The budget of the National Endowment for the Arts was $146 million in 2015. Over the last few years, the military has seen pressure to curb its spending, and many see the diversion of resources to the bands as extraneous and an unrealistic expense. But would a reduction of even a few million dollars, a significant portion of the bands’ operating costs, do anything significant to slim the catastrophically wasteful Department of Defense budget? And is the loss of value that the bands bring worth reducing expenses by less than one-tenth of one percent? The value that the military bands offer is far greater than a small percentage point reduction on a budget line. The historic precedent for Pentagon funding for these programs stretches back to the United States’ founding. In the Revolutionary War, military bands made up of traditional fife, drum, and bugle were used to communicate with fellow soldiers across long distances. Players in these bands improvised beyond this necessary function, however, creating innovative tunes and marching rhythms (like the perennial favorite, “Yankee Doodle”) to motivate their fellow soldiers and intimidate any enemies who may be listening. Outside of the U.S., music in wartime has been an important way for the military to demonstrate its power and prowess both on and off the battlefield. Since the very beginning of the U.S., the military has burnished its reputation as a superpower in all aspects of combat, including through musical prowess. When today’s military bands play for visiting dignitaries at the White House, perform at U.S. embassies abroad, honor the dead at Arlington National Cemetery, or participate in countless other ceremonial functions, they are demonstrating the extent of the soft power of the U.S. military. Sophie is a New York-based arts nonprofit fundraising professional with experience in major gifts, individual, and foundation giving. She holds a bachelor's degree in Music and English from Barnard College. While the Trump administration quickly walked back its proposal to cut federal funding of the Special Olympics, other US Department of Education programs may be less secure.